For a moment, it looked as if the finance secretary would subside into chortling. But he mustered sufficiently and speedily to complete his statement with a degree of assurance. But, of course, when the dust dies down, the Tories will return to that attack. 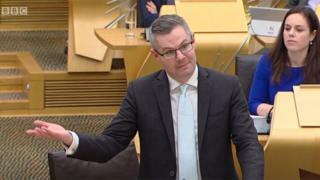 We got a foretaste from Murdo Fraser today when he suggested that the move to impose slightly higher taxes on earnings of more than £33,000 would discourage ambition. Be clear too that the overall burden of taxation in Scotland has increased. Be clear, further, that take home pay for those earning above that £33k threshold will be higher south of the border. But, given that the median salary next year is estimated to be £24k, that allows Mr Mackay to note that the majority will be better off. Look at the figures in some detail and you see some intriguing points. The impact of the Scottish government changes per se are linear. You start to lose at £33k and you continue to lose up to £150,000, proportionally. But look at the changes wrought by those SG policies together with the impact of the inflationary changes to thresholds, drawn from UK calculations. That is more of a sine curve. You gain up to £33k, then start to lose - but you gain again fractionally at £50,000. That is because of the indexation of the Higher Rate Threshold (HRT). Might that be ironed out in further discussions across the parties? I think it might - just as there was a change to HRT last year after talks with the Greens. There is a further element. The Block Grant Adjustment. Mr Mackay is confident that Scotland will benefit from that not just because of tax decisions taken this year but because of decisions (such as the freezing of HRT last year) which generated higher revenue in Scotland, relative to the UK. One more consideration. The overall outlook for the Scottish economy, as set out by the Scottish Fiscal Commission. Their chair, Lady Susan Rice, notes: "Our forecasts point to a subdued outlook for economic growth in Scotland, driven by slow productivity growth and exacerbated by demographic challenges." Not exactly cheery, eh? But then we knew this, or expected it. This is why business organisations warned in advance against tax hikes. This is why Mr Mackay has moderated his revenue raising, in cash and relative terms. This is also why he has accompanied his tax plans with a package of support for business, designed to stimulate the economy. As to other political reaction, expect Labour to condemn. Richard Leonard led the attack today by arguing that the approach adopted in the budget was fundamentally wrong. It was, he said, "Tory-lite", failing to extract more cash from the highest paid. Mr Mackay argued in response that he had been advised that any more substantial increase on top earners could have resulted in lower revenues because of behavioural changes. Not smart, he suggested. Then there's public sector pay, a new policy of three per cent. Will that prove affordable? Will it be sufficient to content angry workers who demonstrated outside Holyrood today? More, who will pay? Willie Rennie of the Liberal Democrats accused Mr Mackay of passing the buck to councils - with a budget settlement for them below inflation. Or rather not passing sufficient bucks. And Patrick Harvie of the Greens followed the same tack. Which really matters because the SNP need Green votes to get their budget through. However, Mr Harvie voiced delight with the tax reform. It seems likely that he will sign up to a deal. Likely, but not yet settled. His price? I would not be surprised if it resembled last year's deal. More for local government - and a reduction in the HRT threshold. If so, expect Derek Mackay to smile once more.